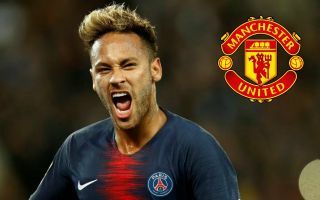 Paris Saint-Germain superstar Neymar has teased fans with a hint that he wants to play in the Premier League in the future following recent transfer rumours linking him with Manchester United. The Brazil international was asked by Manchester City left-back Benjamin Mendy of all people about whether or not he’d like to try his luck in English football some day. It is worth noting that a recent Don Balon report linked Neymar with City as well as United, though it is surely the Red Devils’ need for the player that is far, far greater, while he very much fits the bill as their style of signing. MUFC have a recent track record of bringing in big-name superstar signings like Neymar, and the 26-year-old would undoubtedly be the biggest of the lot. A signing like that could help take United back to the top after a difficult few years, and it seems a spell in the Premier League is on his radar for some point in the future. Speaking on his YouTube channel, Neymar was asked by Mendy: “Neymar Jnr, answer me in French. Do you think you’ll one day play in the Premier League?”. To which Neymar responded: “We don’t know what will happen tomorrow but I believe that every great player, at least one day, has to play in the Premier League.